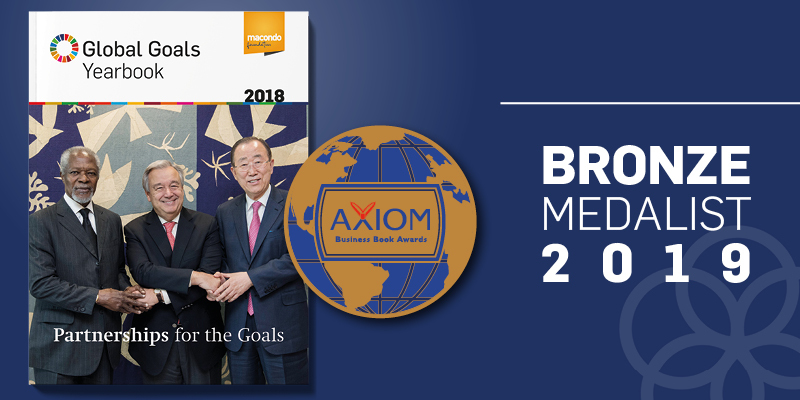 The latest edition of the Global Goals Yearbook 2018, covering „Partnership for the Goals“, has won the bronze medal at the 12th Axiom Business Book Awards. The yearbook finished third in the category “Business Ethics” behind the new book of Harvard authority Clayton M. Christensen. „From a book about the leadership styles of U.S. presidents by a Pulitzer Prize-winning author, to a collection of 99 infographics about the global economy, these medal-winning books epitomize the Axiom Awards motto, „Success through Knowledge,“ by offering business people up-to-date information across a wide spectrum of concepts and viewpoints, helping them succeed in an increasingly volatile world“, said Jerrold Jenkins, CEO Jenkins Group. The exploration of cutting-edge issues is what the Axiom Awards strive for, and all 76 of the medalists, chosen from over 500 entries, have some insight or advice to offer knowledge-seeking business people. This year’s medals went to publishers and authors representing 13 U.S. states, Canada, the United Kingdom, the Netherlands, New Zealand, Germany and Switzerland — a blend of established Big 5 publishers, university presses, and independent publishers of all sizes. The Global Goals Yearbook 2018 covers the question how the Sustainable Development Goals (SDGs) can be financed? Fact is: Sustainable development requires sustainable financing. UN sources estimate the need for financing the SDGs to be from $4 to 4.5 trillion annually. Current annual investments total about $1.5 trillion. So we are talking about an annual investment gap of $2.5 to $3 trillion. To close this gap, financing from private sources is needed, including from capital markets, institutional investors, and businesses. With private-sector engagement, not only does a new player enter the arena, but also new rules are being applied: “Financing” is a fundamentally different concept than the traditional idea of “funding.” It connects the “return on investment” concept with the SDGs. The question is: How do we combine social benefits with profit? The Global Goals Yearbook is a publication in support of the Sustainable Development Goals (SDGs) and the advancement of corporate sustainability globally. As an independent grassroots publication it offers proactive and in-depth information on key sustainability issues and promotes unique and comprehensive knowledge-exchange and learning in the spirit of the SDGs and the Ten Principles of the Global Compact. It is a publication under the auspices of the macondo foundation with a board compromised by UN organizations UNEP,UNICEF, UNOPS, UNSSC as well as WBCSD, CDP and Club of Rome. The Axiom Business Book Awards are intended to bring increased recognition to exemplary business books and their creators, with the understanding that business people are a very well-read and informed segment of the population, eager to learn about great new books that will inspire and inform them, and help them improve their careers and businesses. The awards were created in 2007, and have since become the largest and most respected critical guidepost for business books in today’s new world of publishing. These prestigious and competitive awards are presented in 22 business categories and serve as the premier list to help readers discover new and innovative works.